Are you looking for something other than the typical photo booth for your wedding? When Ann Meyer LeFiles, publisher of Premier Bride of Northeast Florida, got married last fall, she wanted to incorporate historical touches into her wedding. 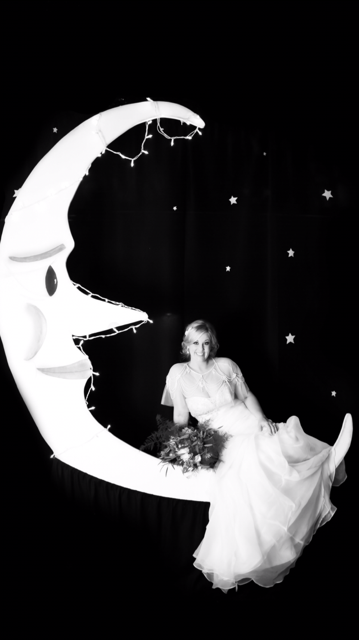 And she came up with an amazing idea for the reception - not just a photo booth, but a Moon Booth! How romantic is this? What's even cooler is that her parents made this moon - you read that right, they MADE it! But what makes this idea really awesome is that your parents don't have to be this creative - you can rent the Moon Booth for your Jacksonville wedding. Want to reserve it for your big day? Email ann@premierbridenefl.com.